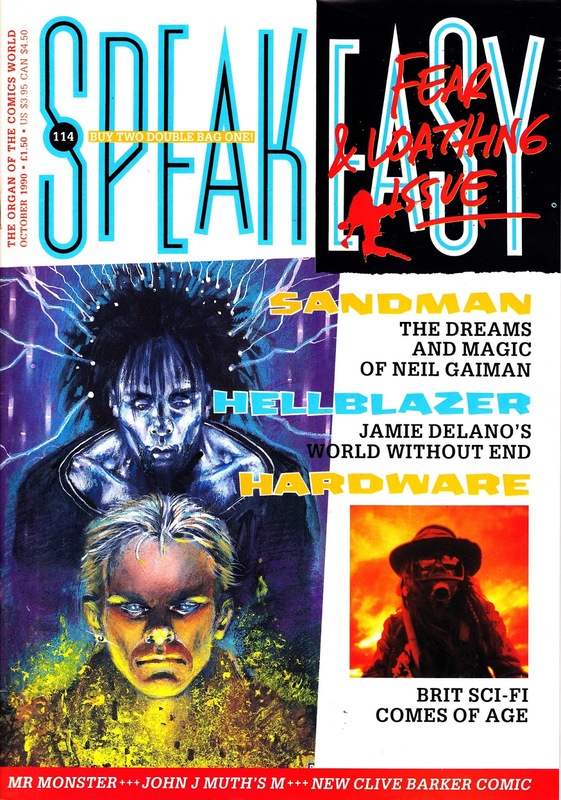 From Autumn 1995... When Worlds Collide: Marvel merges the MALIBU ULTRAVERSE. Malibu had been knocking around for a few years publishing under a variety of imprints (including Eternity and Adventure) when they were unexpectedly thrust into the big time when they signed-up to provide professional services for the launch year of Image Comics. 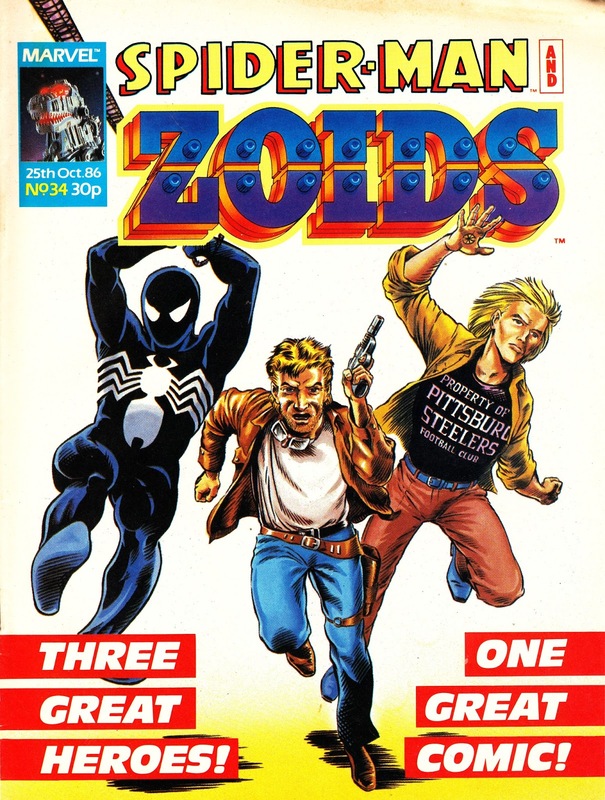 That arrangement didn't last long but once Malibu realised that the market for alternative superhero books was booming, they decided they wanted to hang into their slipped of the action. The result was the ULTRAVERSE, a made-for-the-mainstream new universe which dodged the issue of all the top artists either defecting to Image or signing exclusive contracts with the existing publishers by being a "writer's universe". terms of market share. That put their share price under threat and the whole highly leveraged house of cards in danger of collapse. 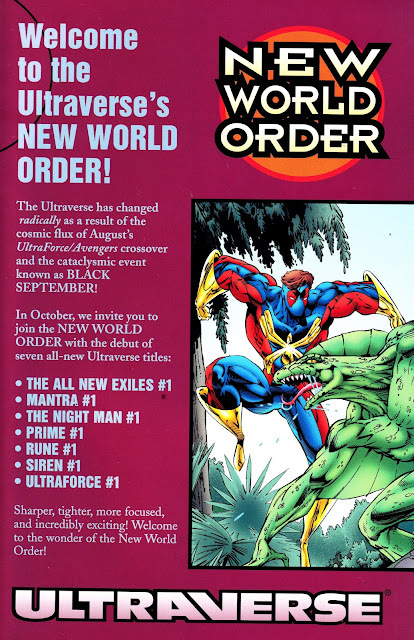 So they swooped in and snapped up their one time rival (DC swallowed Wildstorm instead) and soon went about cutting cost out of their West Coast operation and integrated the spoils of their conquest with the existing Marvel line. The results were Black September and the New World Order reboot. 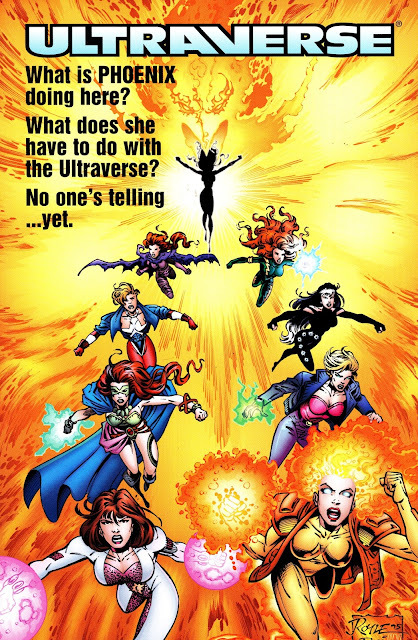 The move was not a hit with fans of either line and Marvel, mired in financial problems, soon shuttered the whole Ultraverse operation (but not before using the Malibu tie-up to secure a new licencing deal with Paramount Pictures through their Trek license). Fuzzy ownership, and financial penalties, have placed the characters out-of-bounds ever since. 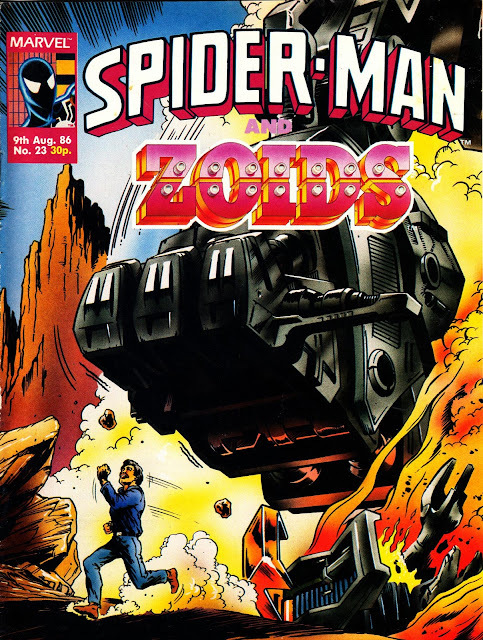 From December 1986: The final four issues of SPIDER-MAN AND ZOIDS weekly for the year. 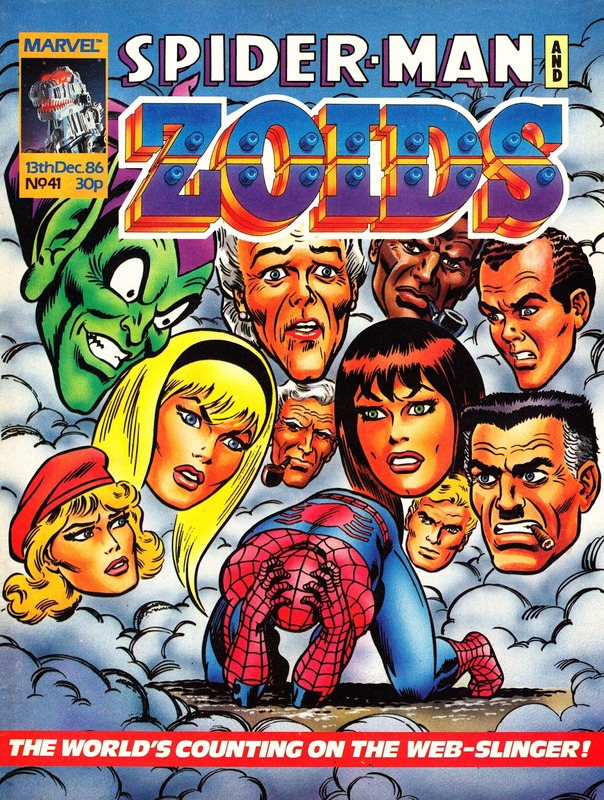 It may be coincidence but its interesting that the bulk of the covers were devoted to the Web Head despite appearing in the run-up to Christmas and the peak period for toy sales. Could it have been that the British Bullpen were testing the appeal of Spider-man whilst formulating plans for splitting the title to allow the ZOIDS to go solo in 1987? 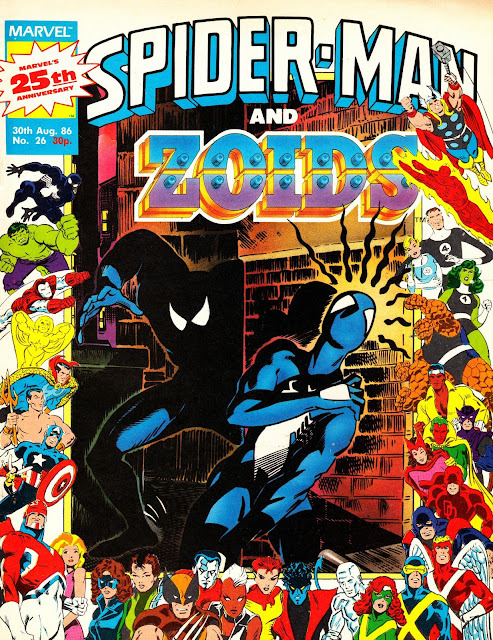 The Spider-man strip was also a crossover with concurrent issues of SECRET WARS II. From July 1988 (and maintaining a TV CENTURY 21 tradition): the first issue of ACTION 21 magazine/ fanzine. Published by the folks behind S.I.G, this was a nostalgic trawl through the back catalogue of Gerry Anderson comic strips, licensed from the original publishers and ITC. The newspaper stylee covers were, of course, a homage to the 1960s Anderson comic at its imperial prime. It was a nice idea and the print and presentation was excellent but too niche to break out into a healthy seller. It ran for ten mostly monthly issues before folding the following year. 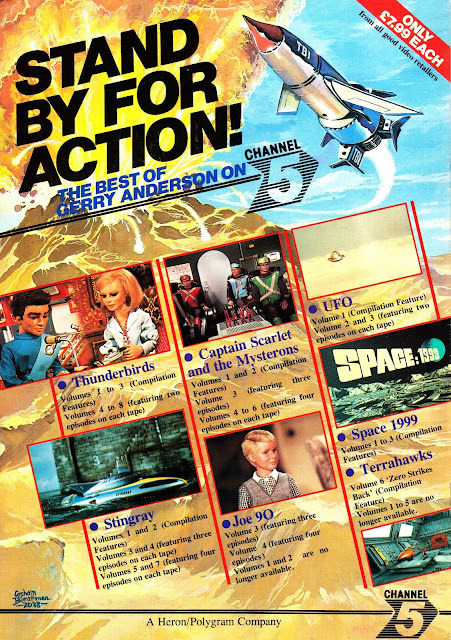 This was only a couple of years before the full-on Anderson resurgence fuelled by the BBC's acquisition of Thundrbirds and other shows from the ITC archives. 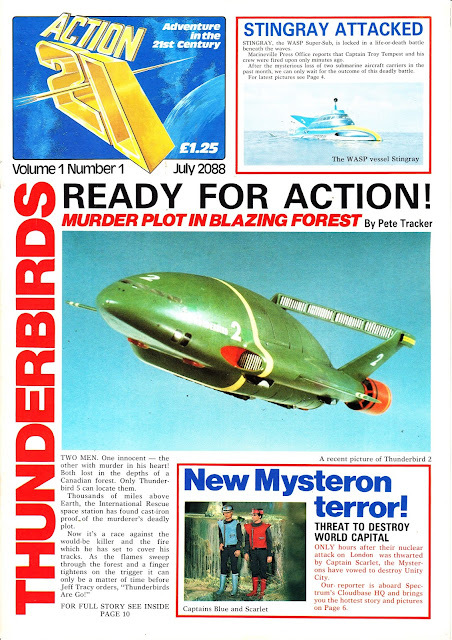 Fleetway plundered the same stash of strips to launch their massively successful THUNDRRBIRDS THE COMIC and supplemented it, to coincide with the TV scheduling, with STINGRAY, CAPTAIN SCARLET and JOE 90. 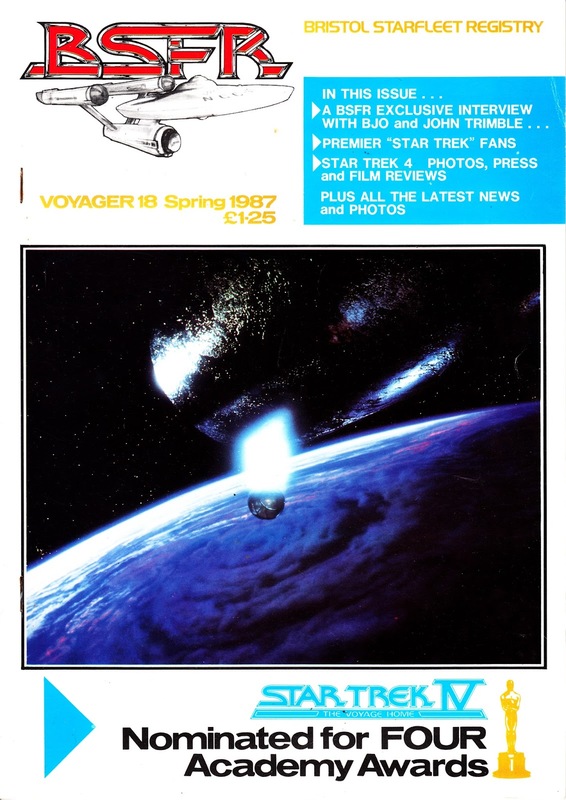 From Spring 1987 (and the Random Scans file): a copy of the Bristol (UK) local STAR TREK group (BRISTOL STAR FLEET REGISTRY or BSFR) newsletter devoted to coverage of the release of STAR TREK IV: THE VOYAGE HOME. 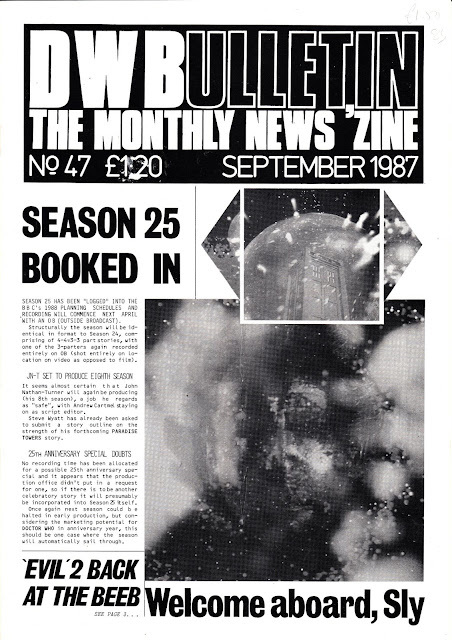 From October 1987: DOCTOR WHO BULLETIN (aka DWB) gets the knives out again. 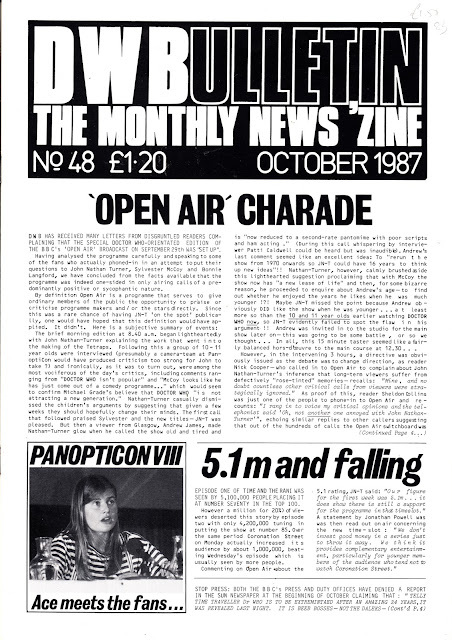 This time, in issue 48, to complain about BBC ONE's daytime daily talkabout telly show OPEN AIR. From August 1986: The British Bullpen are (were) coming to town! 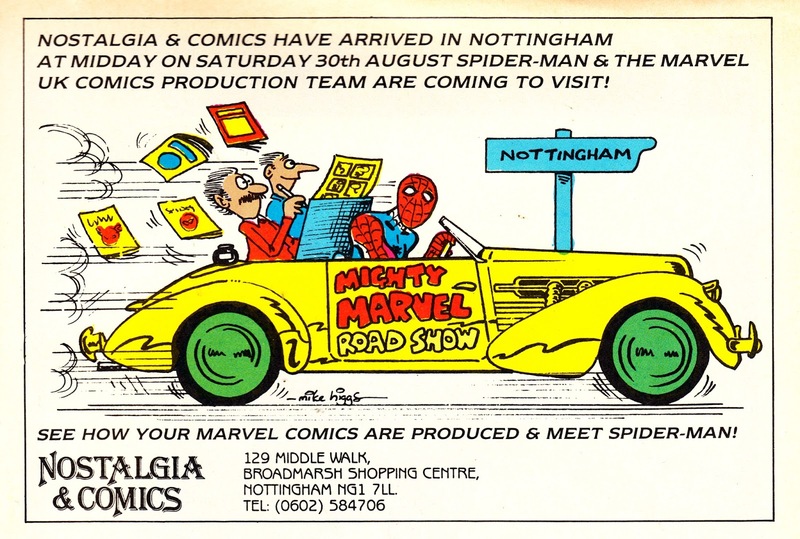 The Redan Place dwellers hit the road (or the rails) for a public appearance at Nottingham's NOSTALGIA AND COMICS. Were you one of the team that made the trip? Who attended? Were you a reader that turned out for the day? Any pictures you want to share? 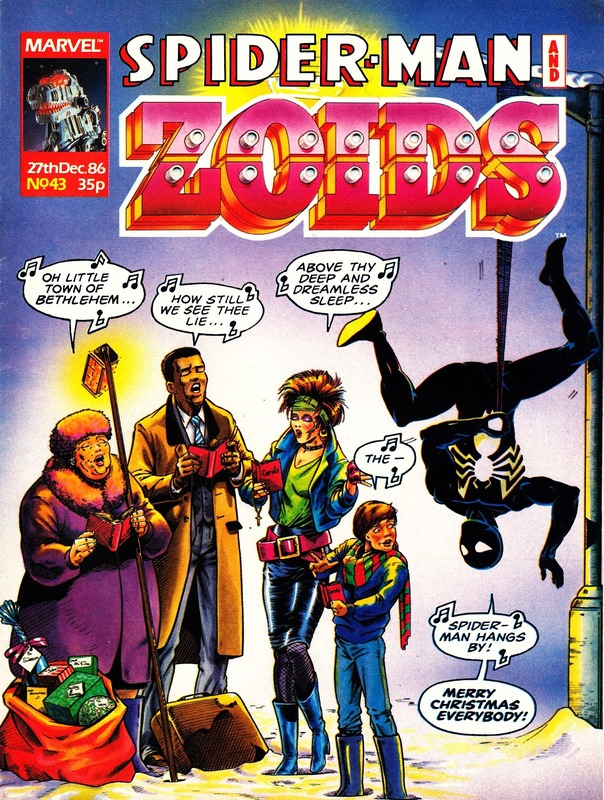 From November 1986: A bumper month for MARVEL UK's SPIDER-MAN AND ZOIDS weekly. 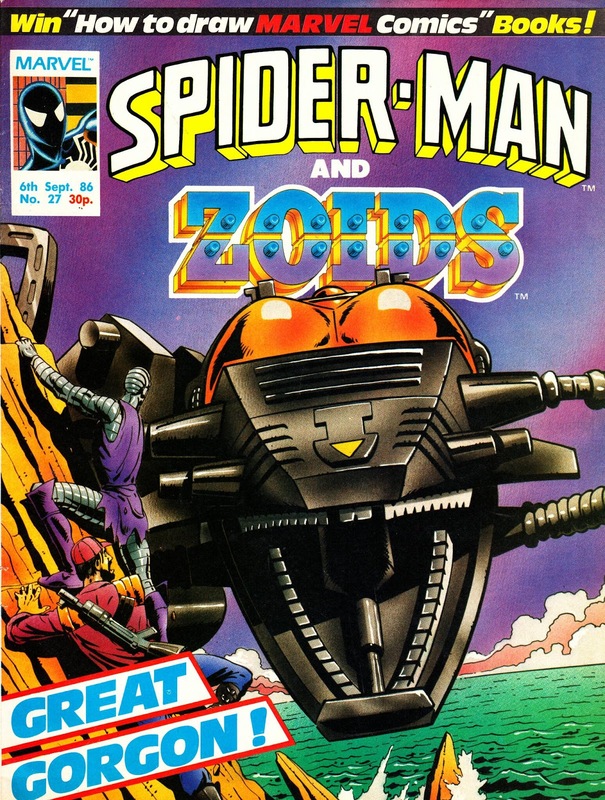 The Spidey strip continued the crossover with SECRET WARS II which kicked-off the previous month. A canny, and fairly unusual, way of cross promoting the two weeklies by encouraging the readers of one to sample the other. That combined readership, however, must still have been pretty small as both titles were defunct within the next couple of months. The crossover fan between issues 33 and 36. 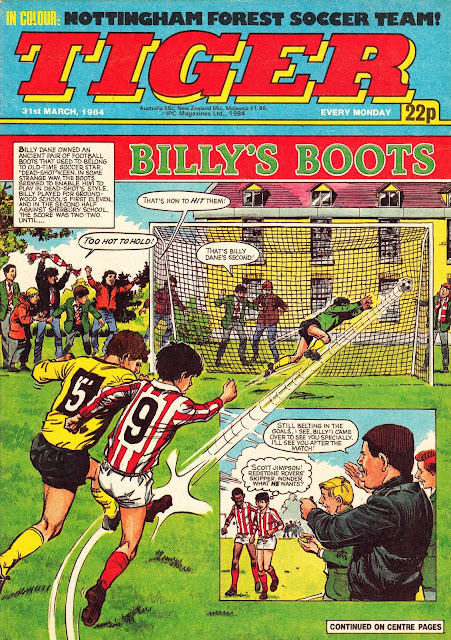 Other things happening in an eventful month: the STAR BRAND strip bowed out after a brief run in issue 37. If you want to know what happened next Marvel have just reissued the first ten issues as a trade paperback collection. The British Bullpen did eventually explain why they curtailed the run... and I'll post that sometime soon. Redan Place's commitment to the New Universe was transitory at best and they dropped this and SPITFIRE AND THE TROUBLESHOOTERS (in THE TFANSFORMERS) pretty promptly. 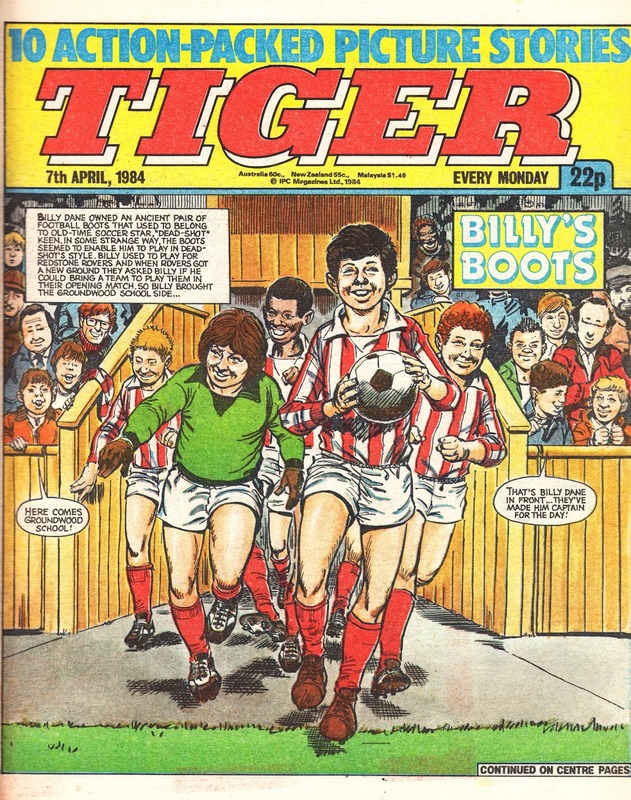 The following week marked the arrival of STRIKEFORCE: MORITURI, another non-core US strip presumably deemed self-contained enough to work well for a British audience. 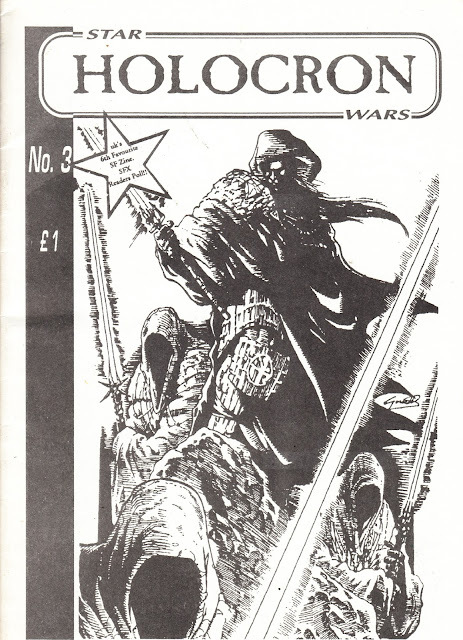 From 1995: the third issue of the British STAR WARS fanzine HOLOCRON. STAR WARS never struck me as having an active fandom back-in-the-day in the same way that STAR TREK or some of the other TV shows engaged fans to create their own 'tribute'. Maybe I just wasn't as aware of what was being created. Or maybe the sheer amount of official merchandise negated much need for anything fan-made. Or maybe SW appealed to a younger fandom who lacked the will and ability to publish in the same way that Trek fans had already been doing for a decade. The 1990s resurgence did start to change that. Fans were obviously older and, for a while, ill-served by a mainstream media that had moved on from the saga far, far away. So titles like HOLOCRON, DARK TIMES and STAR WARS OUTSIDER appeared alongside STAR WARS MAGAZINE, GALAXY, INSIDER etc. I would argue that the Expanded Universe was a repository for all the fan fiction that the saga had previously failed to spawn. 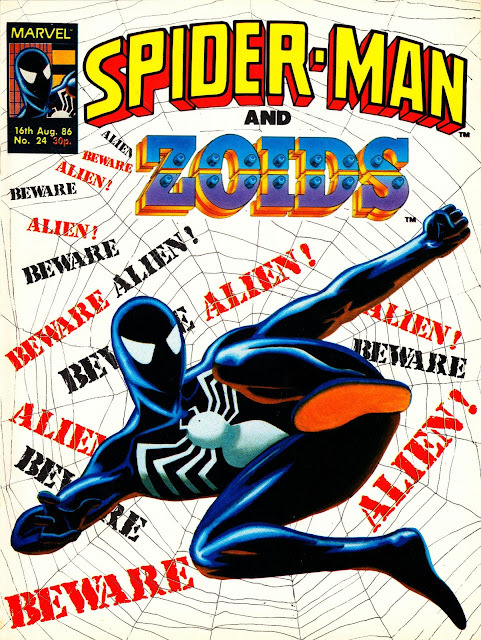 Writers were finally let loose to nose around the universe and devote many pages to the smallest and most throwaway aspects of the movie series. And all with the endorsement of Lucasfilm. Holocron was an A5 zine with colour stock cover (this issue being a dull shade of grey) and the standard black & white interiors. The articles ran the gauntlet of the films themselves through to the then current publishing boom. 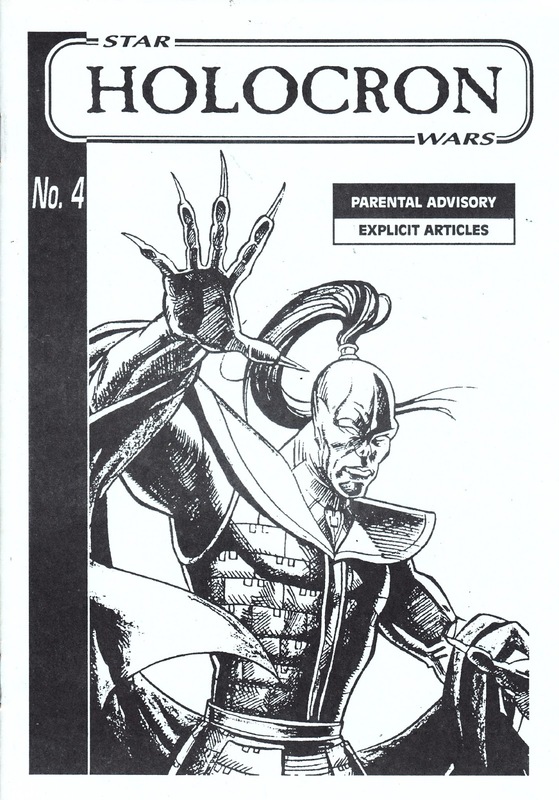 Articles of interest included a detailed looked back at the MARVEL UK original strips from EMPIRE STRIKES BACK MONTHLY from a period when no one was writing about them. 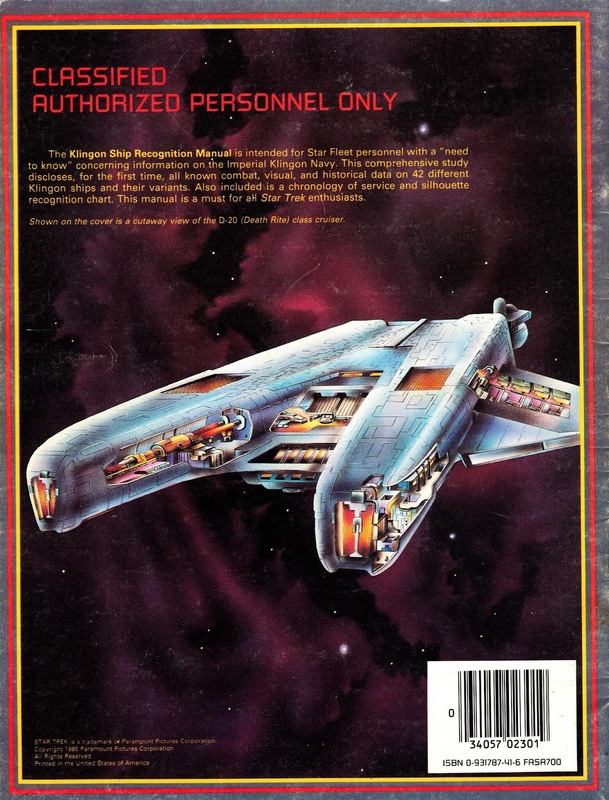 From 1985: Know your enemy (and, eventually, your friend)... the ever so handy KLINGON SHIP RECOGNITION MANUAL, an in-universe supplement created for FASA's STAR TREK THE ROLENPLAYING GAME. 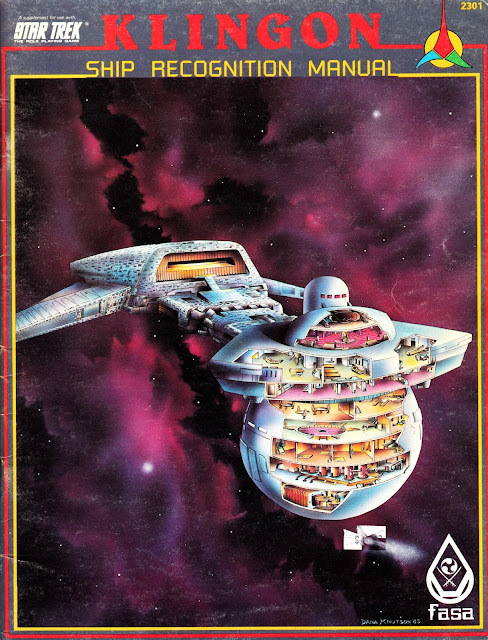 I've previously published the Federation equivalent and I'll post the Romulan edition in the near future. TV and movie budgets, combined with finite screen time, meant that before TNG we hadn't actually seen much of the Klingon space fleet... so FASA's creative team basically made it up. Padding out the scant information presented for the screen-seen craft with copious supplementary 'facts' and a fleet of hitherto unseen vessels that might make game night more interesting. I suspect most Trek fans, unless they were also Role Playing fans, were largely oblivious to the existence of these guides as they sold mainly through games outlets rather than comic book stores or traditional book stores. 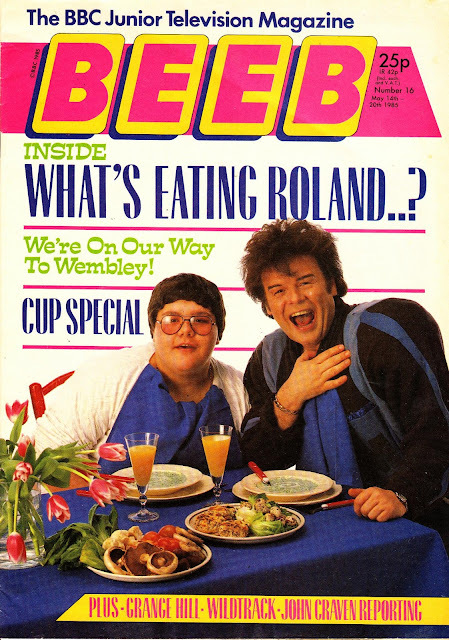 From May 1985: A somewhat unfortunate cover (in retrospect) from Polystyle's BEEB. 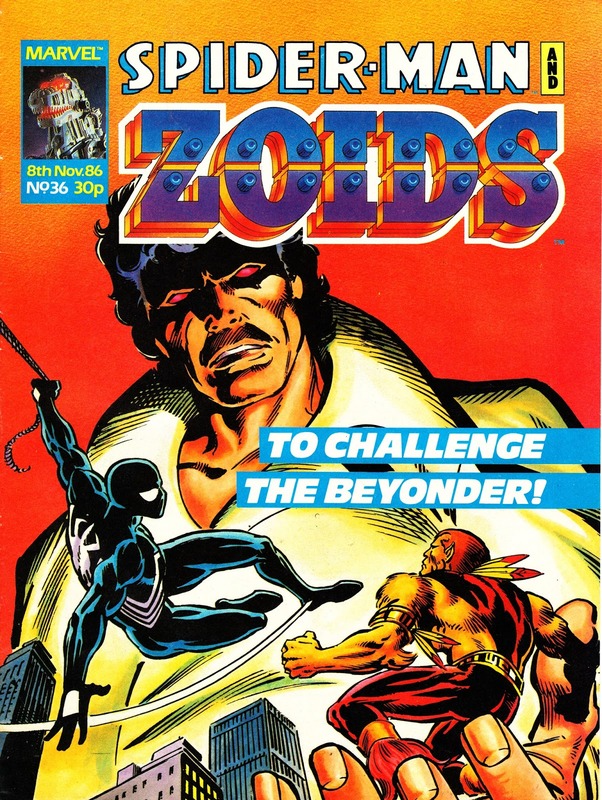 This weekly was a belated attempt to get a BBC version of LOOK-IN off the ground, built around BBC talent and any BBC TV show deemed of vague interest to the target audience (hence the choice of deathly dull zoo vet drama ONE BY ONE as one of the strips). The main differences between the two rivals was that LOOK-IN benefited from being an off-shoot from TV TIMES and therefore owned by the network of ITV local operators. BEEB, on the other hand, was published by Polystyle and not BBC Magazines (the BBC Enterprises offshoot that housed the RADIO TIMES) and therefore more arms length from the corporation. Plus: it tried to be all things to all readers and was pretty dull compared to its main rival and the other adventure weeklies of the time. 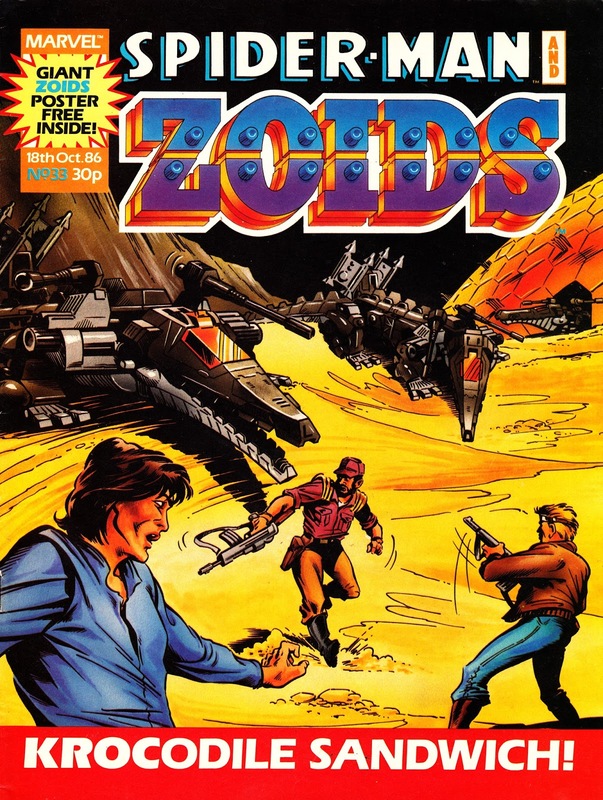 Polystyle had previously published TV COMIC, the long-running weekly which (despite a brief renaissance towards the end) they'd finally crashed into a mountain a year or so earlier. LOOK-IN was also able to leverage its ownership to bag regular promo slots across the ITV network and helpful plugs within programmes. BEEB couldn't invade BBC airtime in the same way which left it at a disadvantage. The BBC didn't make the same mistake when it launched FAST FORWARD a few years later, giving the in-house mag copious free airtime (Fast-Fast Forward) in the critical 5.35pm BBC ONE junction sandwiched between the official end of CBBC and the start of NEIGHBOURS (except for viewers in Northern Ireland... who opted away half-way through the final bit of Children's in-vision continuity). 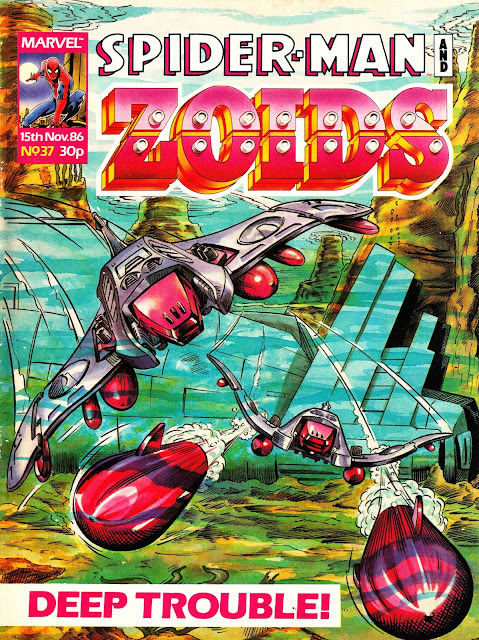 Launched in late January 1985, it vanished without warning after the 20th issue in early June. 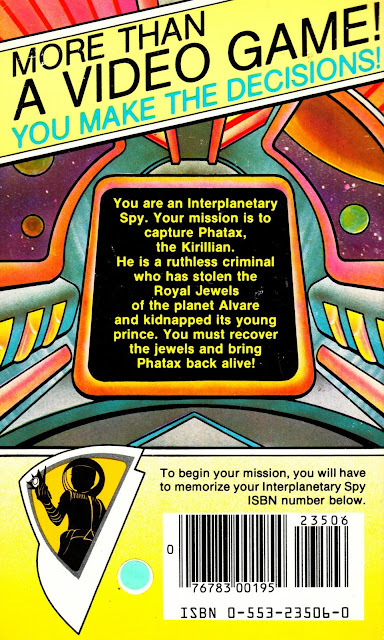 Other strips included Larson-tastic AUTOMAN, THE TRIPODS (a great deal more exciting than the TV show), BANANAMAN (new strips based on the animated series based on the NUTTY character from rival DC Thompson) and - not for the first or last time - GRANGE HILL. 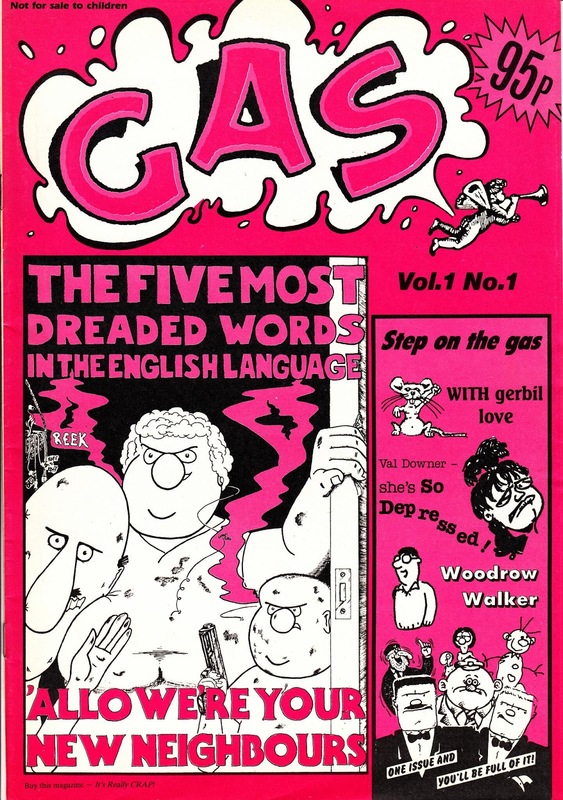 From the autumn of 1994: British fanzine COMICS FORUM (from The Comics Creators Guild) featuring ELVIRA (from her Claypool Comics series which ran for 166 issues). There's a good line-up of articles and it's easy to spot in the back issue boxes thanks to its nigh on florescent cover design. From 1989: the third, and final, INDIANA JONES ANNUAL published by Marvel UK. Once again it was pegged to a movie release but, unlike its two predecessors, it didn't include an adaptation of that year's film. 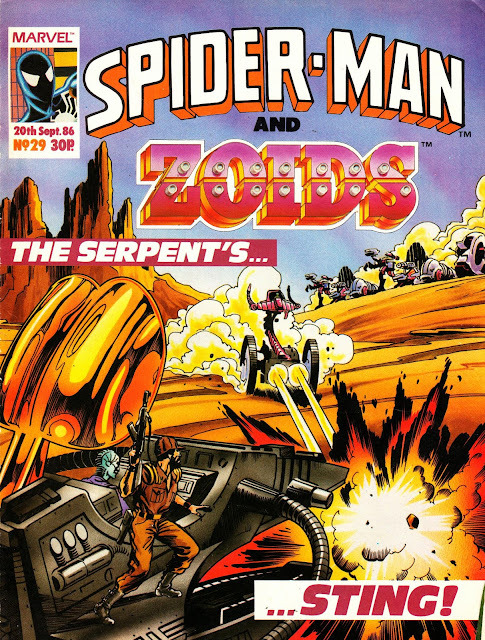 The strip version of INDIANA JONES AND THE LAST CRUSADE had two outings courtesy of the British Bullpen: a done-in-one special which reprinted the whole thing in black & white (a fairly backward step considering London had switched to a virtually all-colour, at least in the comics, operation by this point) and a serialized colour reprint in the pages of THE INCREDIBLE HULK PRESENTS. 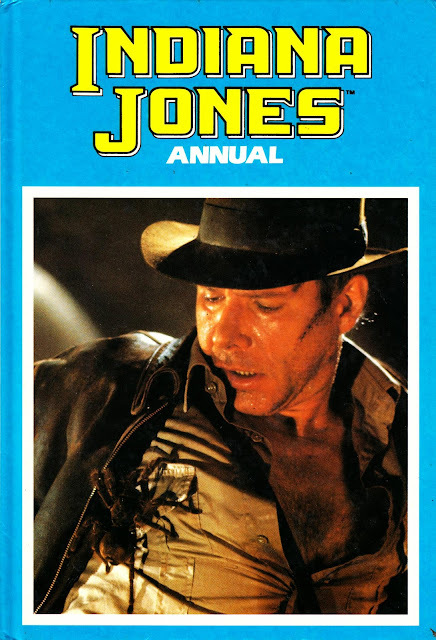 This annual did include some text and picture features on the film but the bulk of the contents were strip reprints from Marvel's THE FURTHER ADVENTURES OF INDIANA JONES. 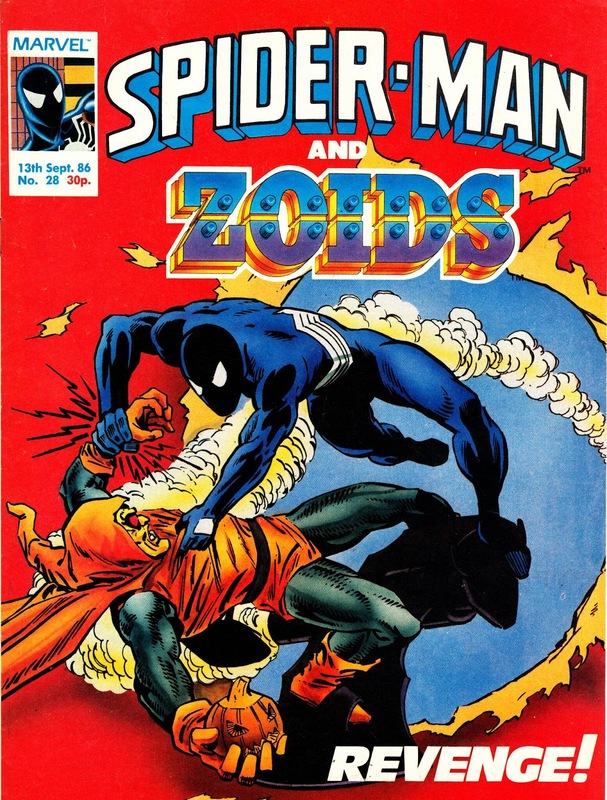 The two part story had, from memory, originally appeared in issues 4 & 5 of the US book. 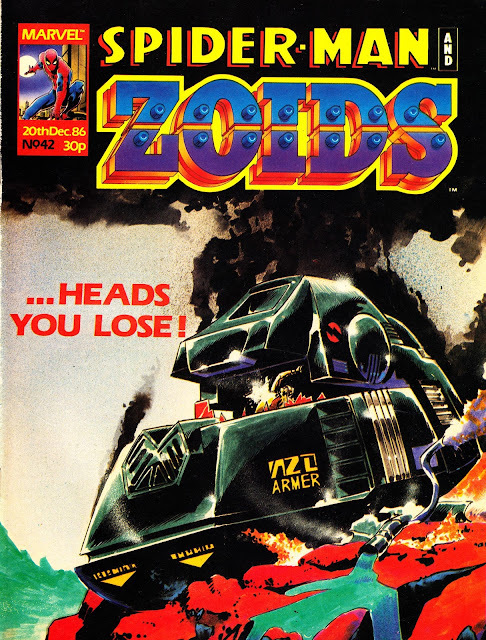 It was also the storyline that was in mid-flow when Britain's STAR WARS MONTHLY morphed into RETURN OF THE JEDI weekly. The annual was the first time the strip had appeared in the UK in colour throughout. Why that particular two-parter? It partially took place in the UK (albeit a stereotyped version of the UK concocted by a creative team who hadn't done a ton of research) culminating at Stonehenge. One odd thing about this book is that it appeared in both hardback and softback editions, most unusual for an annual. 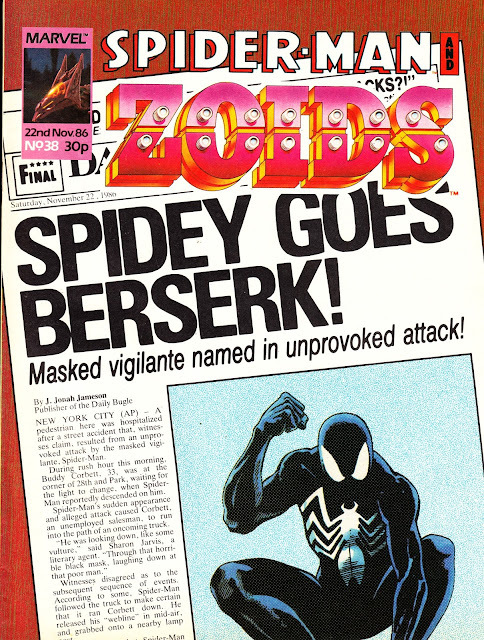 There is nothing to indicate that either edition was exclusive to one particular chain or distributor. The contents are, as far as I can tell, identical. 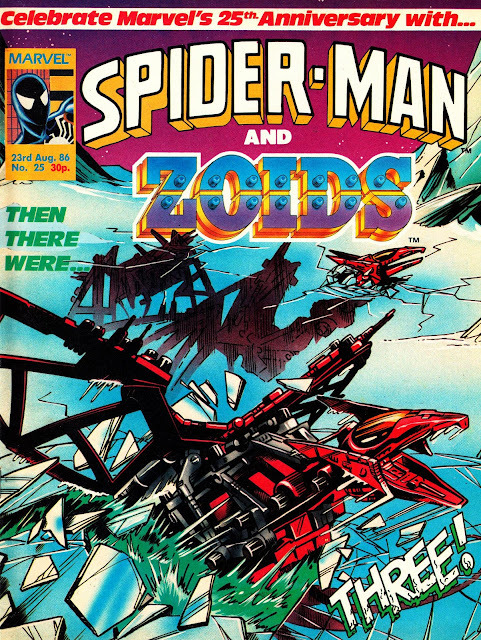 From September 1986: the next four issues of MARVEL UK weekly SPIDER-MAN AND ZOIDS. 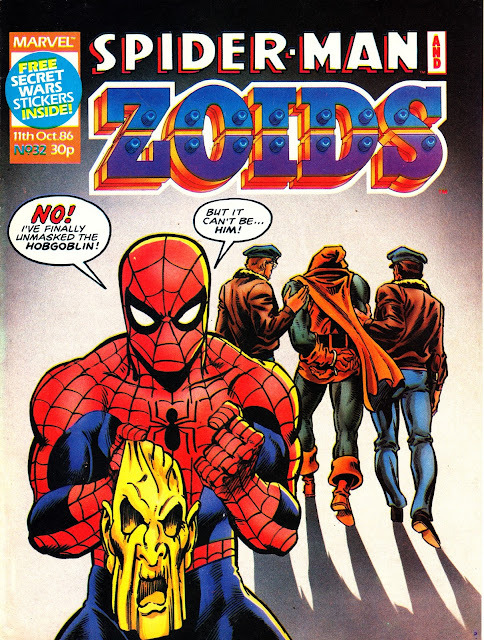 The first three issues of the month continued to publish just the two titular strips with the extra pages freed up by dropping the third feature allocated to the Spidey reprints. The Zoids strip, with its weekly deadlines and higher origination costs, was restricted to its traditional page count. Issue 30 boasted both a revised cover design (possibly intended to make the masthead less unwieldy, although the size and prominence of the toy logo looks locked and possibly contractual, leaving Spider-man to suffer the shrinkage) and the return of the third strip. 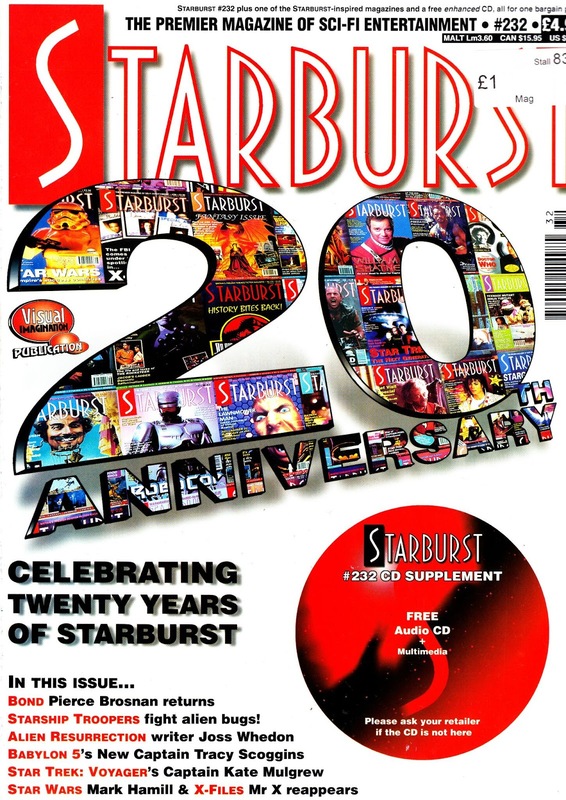 The cynic in me suspects that STAR BRAND was selected because it just happened to be written by Jim Shooter, the US Editor In Chief who was a recurring visitor to the British Bullpen during his period at the top. What better way to keep the New York office happy than to reprint Shooter's strips? The concurrent SECRET WARS II was also one of his. 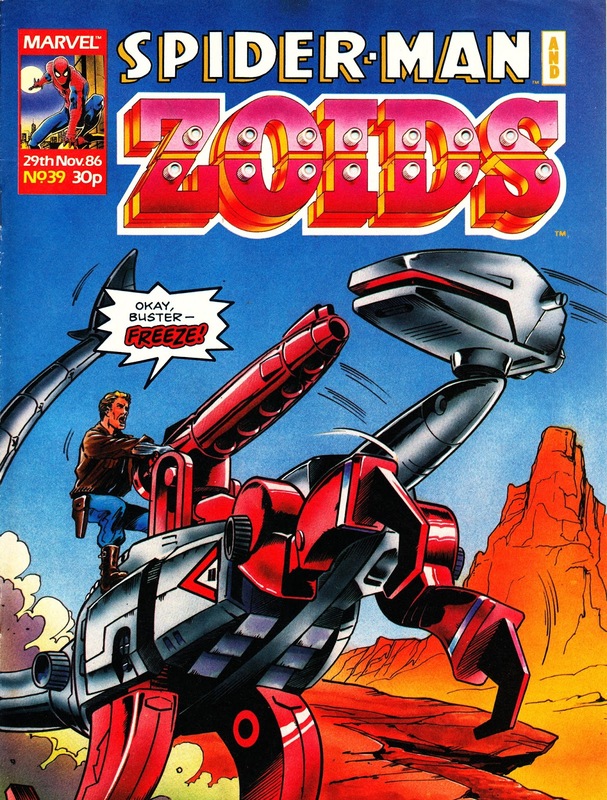 It also demonstrated, along with the SPITFIRE AND THE TROUBLESHOOTERS strip in THE TRANSFORMERS, that the British Bullpen were backing the NEW UNIVERSE. 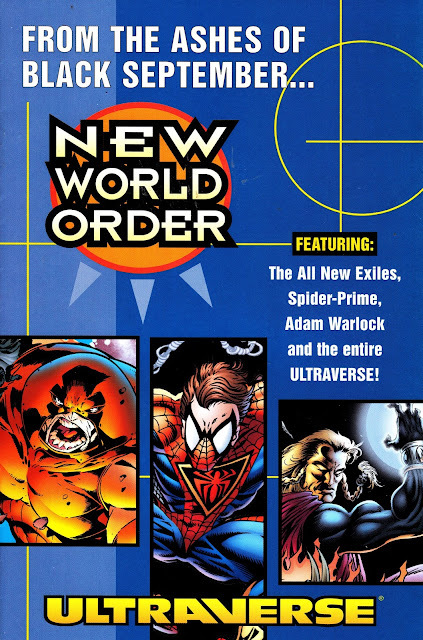 The new publishing line contracted and then collapsed soon after Shooter was shown the door by Marvel's new corporate owners (New World) and Marvel UK dropped both strips as soon as it looked dignified to do so. 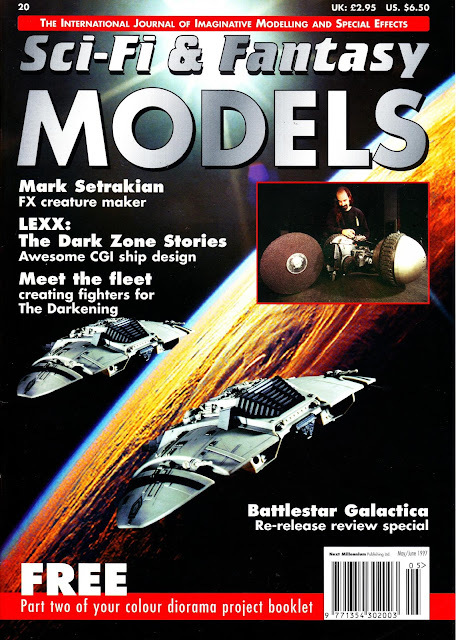 From June 1997: Cylon Raiders, from BATTLESTAR GALACTICA, menace the cover of SCI-FI & FANTASY MODELS issue 20. 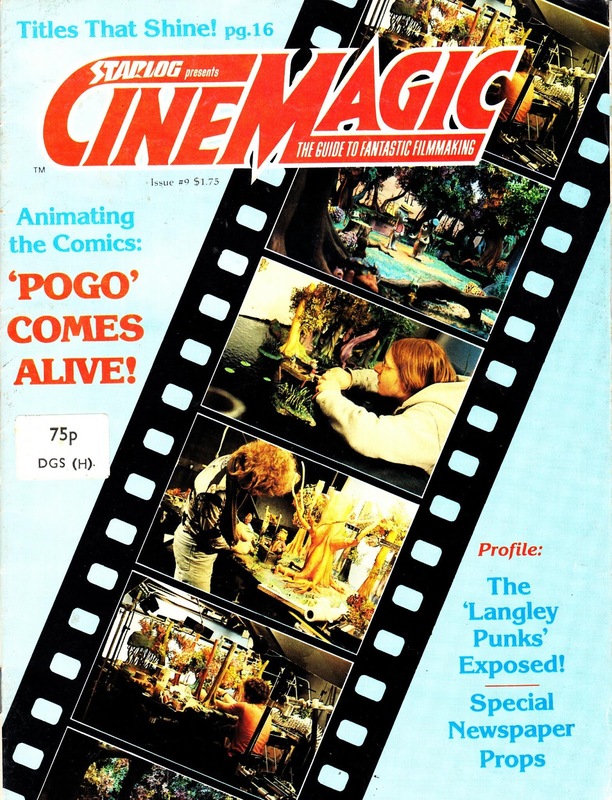 From 1980: a random issue of STARLOG spin-off CINEMAGIC MAGAZINE. 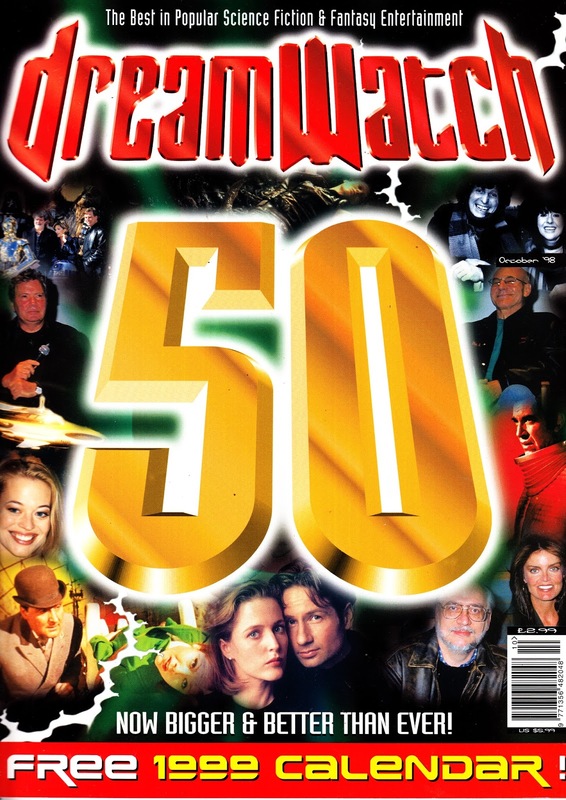 I'm pretty sure I never saw a copy of CINEMAGIC at the time it was published. 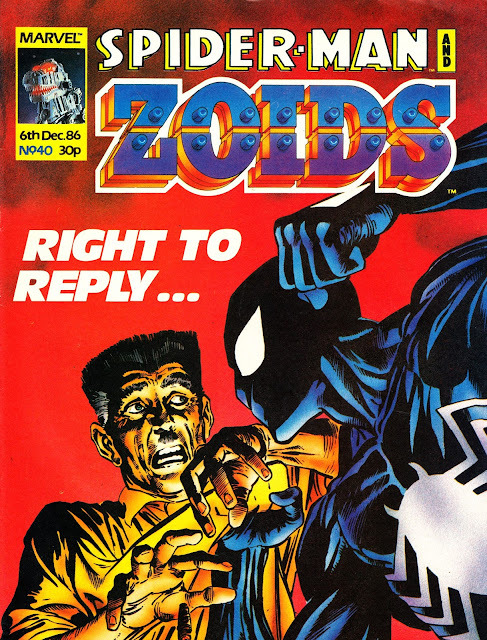 Whether this was down to hopeless UK distribution (although this one has a distributor price sticker attached so someone was shipping 'em in) or whether it was because it was incredibly niche is unknown. The target audience for Cinematic appears to have been the sorts of people that made movies in their garages and basements. Or, I suspect, people who harboured dreams of making movies but never quite got around to it. This was published in the era before computers replaced old-fashioned art and graft and before the familiar refrain "we'll fix it in post". 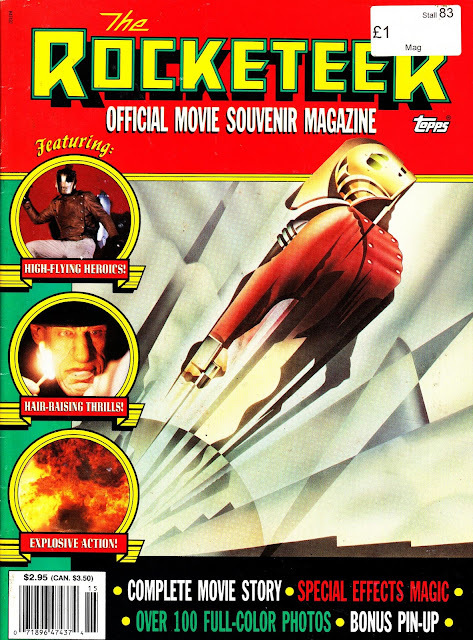 The mag was launched by filmmaker Don Dohler in 1972. He published the first eleven issues before Starlog Group added it to their stable in 1979. Starlog rebooted with a new first issue and went on to publish a total of 37 issues through to closure in 1987. This is the ninth issue of that second run, published in 1980. 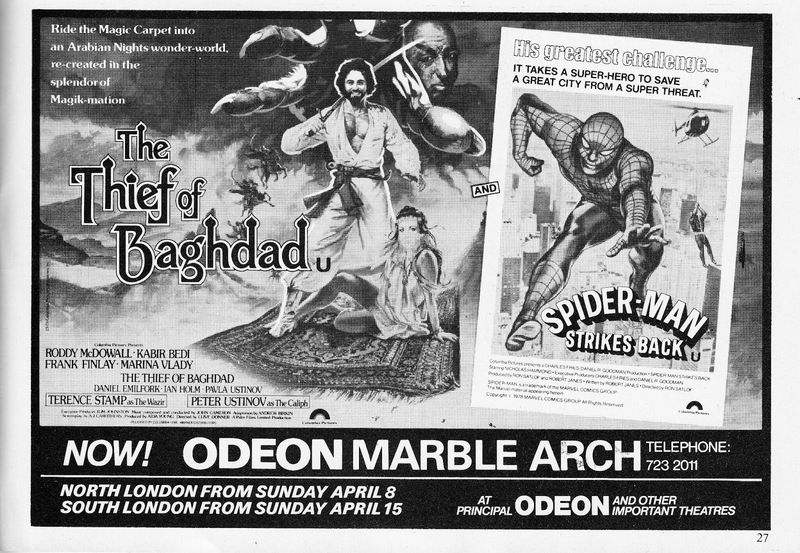 From April 1979: a UK print ad for the theatrical double-bill of SPIDER-MAN STRIKES BACK (compiled from episodes of the brief CBS series) paired with THE THIEF OF BAGHDAD. This was presumably concocted to give the kids something to do during the Easter holidays. 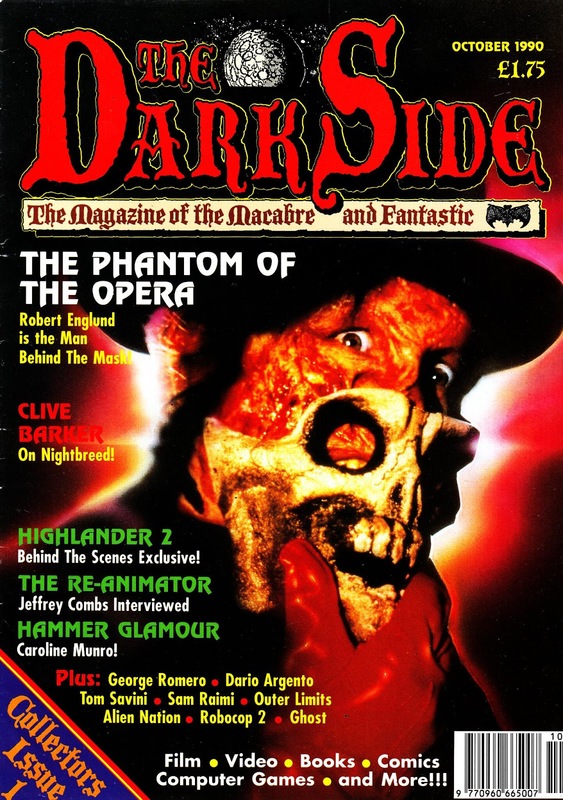 The fact that they were released a week apart depending on which side of the Thames you lived suggests that the finite number of prints were hauled off the projectors after a week, chucked in the back of an Odeon van and sent south to new (temporary) homes. From April 1994: the first issue of the first DROIDS series from Dark Horse Comics. With the obligatory for the time cover enhancement. Yesterday was, of course, STAR WARS DAY (4th May blah blah) and Marvel made the most of it coinciding with New Comics Day by shipping ten different SW reprints under their "True Believers" banner of $1/ 75p sampler series. 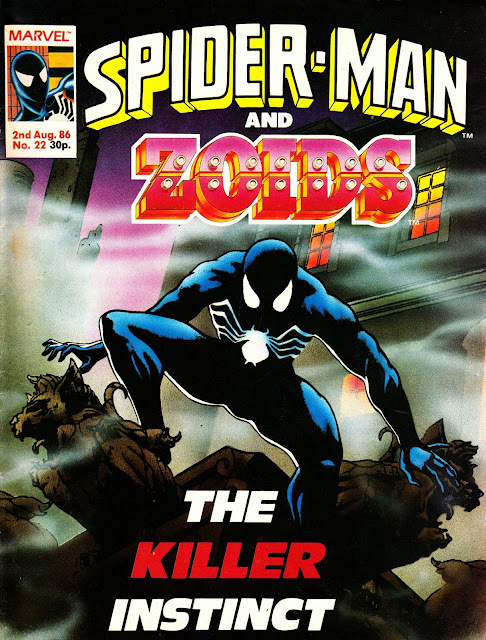 Seven of the ten were reprints of recent first issues from the second Marvel era and basically designed to make you go out and buy the trade paperback collections. 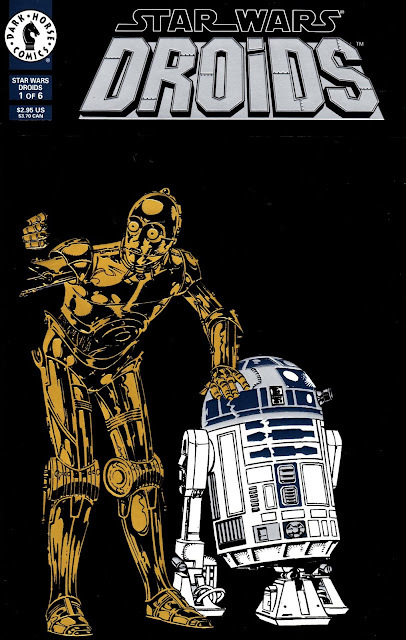 One was (yet another) reprint of 1977's STAR WARS issue one, albeit now boasting the new colouring created for the recent hardback from Marvel. Another was a collection of recent Marvel Star Wars cover art. I didn't cross reference with the recent hardback collection of similar art but I have a hunch this may be a different selection. And the last was the most fun... and the reason (however tenuous) for this post. They reissued the first issue of the old Star Comics DROIDS series, based on the single-season animated show from the mid-eighties. 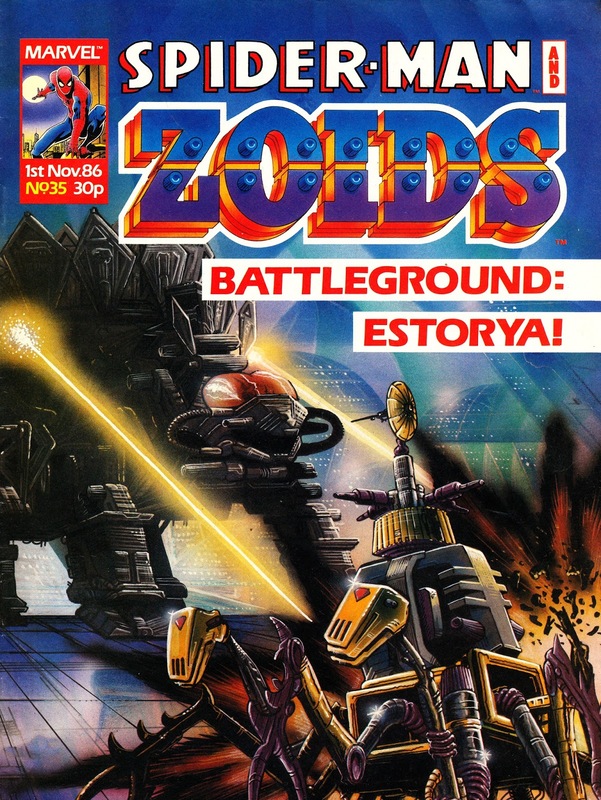 Its essentially a Dollar plug for the upcoming (June) compilation of the full DROIDS and EWOKS (which didn't generate a sampler) runs. 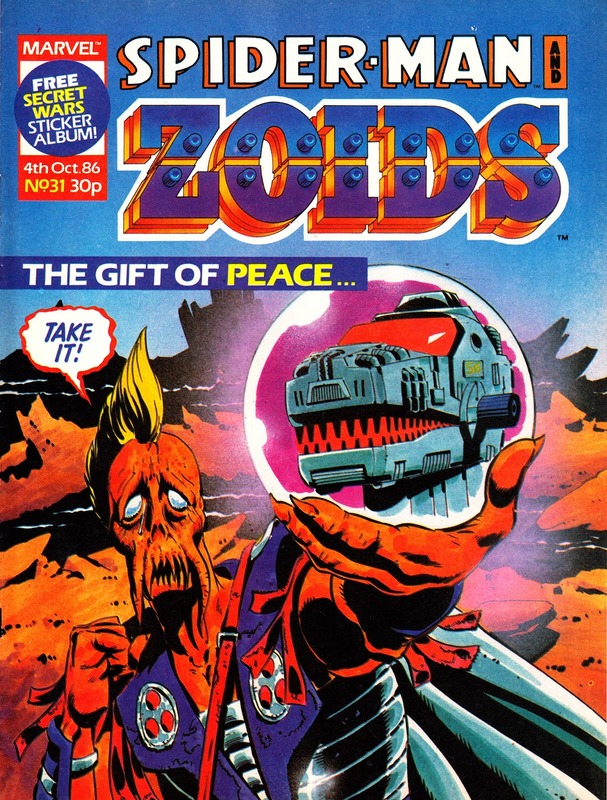 Smart Star Warriors will recall that Dark Horse published their own omnibus compilation of the same material a few years ago. 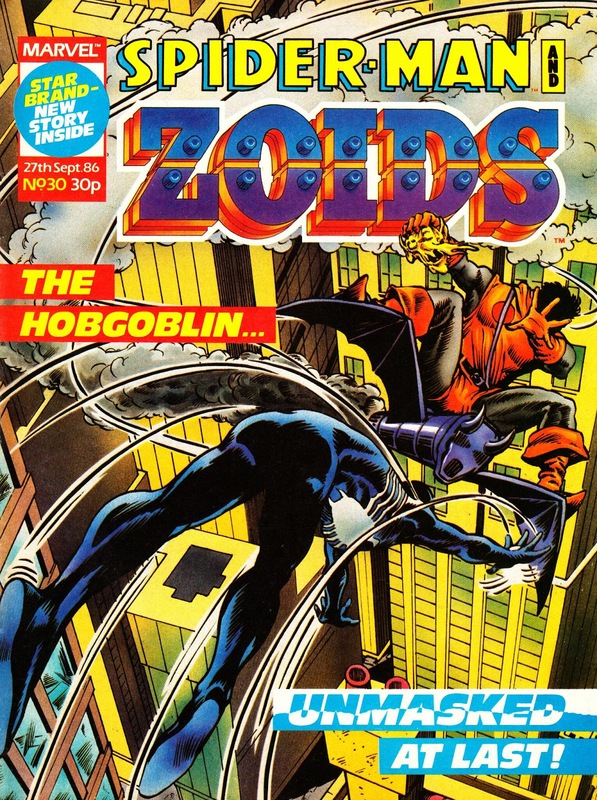 This 1994 series, one of the first wave of Dark Horse titles before it all became too much, followed the same premise as the animated show (the twosome in "solo" adventures) but took things (a little) more seriously. 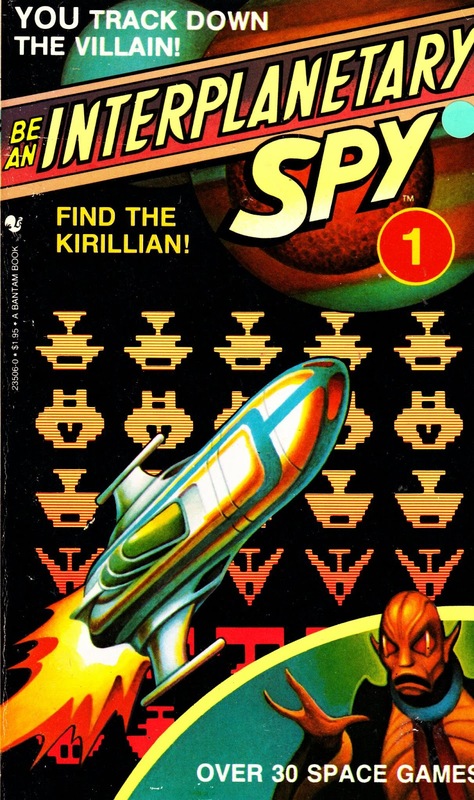 One story, The Kalarba Adventure, spanned the six issue run.